As the new Sampling and Demo Assistant at the co-op I have had the job of sampling quite a few new and exciting products. Last week after sampling Pamela’s gluten free cookies (they come as a mix to add butter and eggs to), I knew I had to try more of their products so I bought the gluten free pizza dough mix! Sheep’s cheese (by Hidden Springs Creamery) was also something that I had recently given out samples of so I needed more of that because it was amazing and when I picked up a pear from the Scratch and Dent section available to co-op employees, the idea for this pizza was born! I mixed some Bragg’s spice blend (ironically from a small packet I got as a sample from the co-op several months ago and never used) in the crust to jazz it up as well. After a summer of canning certainly have tons of tomato sauce but I decided to forgo sauce for some Driftless Orangic’s sunflower oil instead. I was afraid sauce would over power all these delicate flavors. Chopped up red onions, the most flavorful mozzarella I have ever had (from Carr Valley), and a swirl of balsamic cream (sent to us from Jamie’s sister in NYC) completed the deliciousness. The end result? 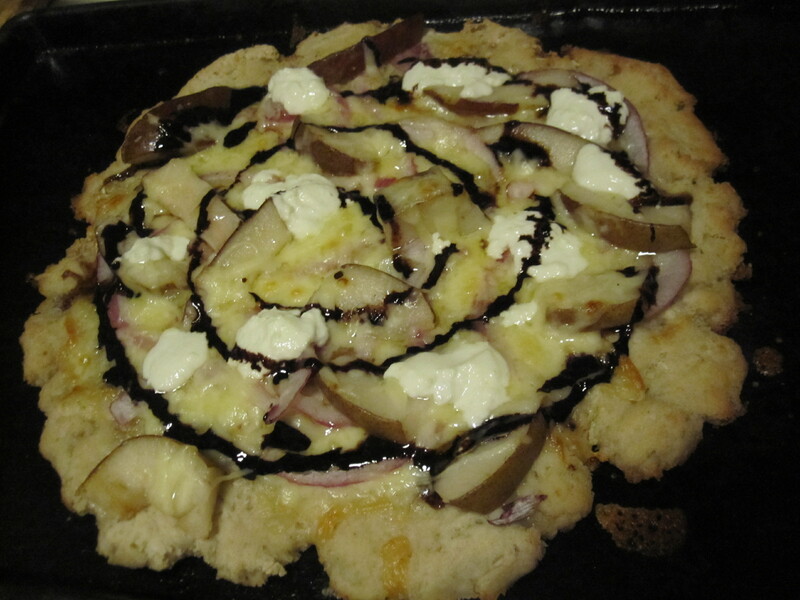 Pear and Local Sheep Cheese pizza with gluten free crust, red onion, local mozzarella, local sunflower oil, and balsamic cream. Doesn’t the name just flow off your tongue? Okay, maybe not but I bet you can tell how good it is! It was absolutely amazing. So amazing that I had to share. With all those run-on sentences and everything. Yumyumyumyumyum!